God is using our network to influence and shape the church planting culture through both solid theology and contextualizing the gospel. We will not waver on either of these commitments. We won’t water down our theology to reach more people and we won’t attack the culture in the name of Christianity. For as long as I can remember in my ministry, I have tried to champion the idea that the church should be robustly theological in what it does while being relevantly intersected with the culture it hopes to reach. Needless to say, the A29 guys are my kind of people. So I would be lying if I told you anything but that I’m very grateful and pumped that my church and A29 have crossed paths. Frankly, the story God is writing upon the hearts of our elders, in particular, and the church as a whole is amazing in and of itself. While I would be the first to say that we have, and will, intentionally try to learn about how others do church from a myriad of different people and movements in evangelicalism (and outside of it), I think there have been many who serve in “Willow Creek-model” churches (read seeker-sensitive churches) that look in bewilderment at our church. It is likely because, initially, our church took the same path as theirs, but now we return from Chicago not due to a Willow Conference but The Gospel Coalition. Indeed, one of the great personal “moments” for me that spoke of my church’s journey happened while I was in Chicago. One of my good friends, finding out that I was in the Windy City, contacted me asking where I was because he was on his way to Chicago and wanted to meet up. He likely assumed that if I was there for church-related stuff then surely I would be at Willow, right? Well, while he was at Willow (speaking at one of their main sessions I might add) I was across town gathering with our executive staff as we heard pastors and scholars talk about the need for gospel-centered ministry. Let me add, I would have no problem attending something at Willow I felt would benefit my leading the church (I have in the past and likely will at some point in the future), but some would look at our church’s last few years and exclaim, “Boy, how times have changed,” but the truth is, our church was always a little different. I remember a church consultant telling us that we were the “most theological church” he had ever been around in his circuit of fast-growing, contemporary, attractional churches. At first I thought that to be a sad commentary on other congregations because I didn’t feel we were doing anything special. Why wouldn’t theology (literally, the study of God) be important to leaders of a local church? I will never forget what theologian A.W. Tozer once said, “What comes into our minds when we think about God is the most important thing about us.” We didn’t need convincing of that truth. Our executive staff has always believed a sound, biblical theology blesses the church, not holds her back. On the contrary, to do anything less is both unwise and ungodly. That’s why, for example, everyone must read a brief theological primer before becoming a small group leader at our church. It’s why we spend weeks from time to time teaching about doctrines (we just finished a five-week series on ecclesiology last Wednesday). It’s why our teachers (from student ministry up) gather every week to listen to a doctoral level seminary class on gospel-centered preaching. And why we will be taking most of our staff (including preschool, elementary, junior high and high school ministries) in an eight-month study of Wayne Grudem’s Systematic Theology (yes, the 1,200+ page book) in the fall. Being theological isn’t something we do, it’s who we are. Unfortunately, to some churches who have elevated the pragmatic to an almost idolatrous level, those examples may seem impractical if not ludicrous. 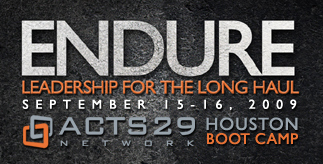 I could go on about other areas where God is growing us – our desire to be gospel-centered, to be missional to our community and so on – but I share this to help some outside our walls see that when Acts 29 approached us asking if we might host their Houston Boot Camp, it only seemed natural for us to say, “Yes. Absolutely!” In my mind, these guys were our kind of people…and the truth is, they always had been. So this September, when hopefully hundreds, if not a thousand or so church leaders descend upon our campus to hear some of the best and brightest pastors in the Acts 29 Network talk about the need to be doctrinally sound, theologically robust and gospel-centered in order to more effectively accomplish the mission of Jesus in the world, the least surprised (and most grateful) in the room will be those of us on staff. September can’t get here soon enough! Welcome A29! Here’s to a great partnership for the church, for the gospel! Yancey, great post. We are all blessed to be led by the CCCC pastors. I am greatly appreciative of the church’s vision and mission and focus on sound theology and doctrine. Words cannot express how thankful I am for CCCC. Thanks! Thanks Matt. I appreciate your words. In the last 24 hours this post has had over 1,000 hits so I was thinking to myself, “Goodness, I hope I did the thoughts in my head justice and didn’t misrepresent anything.” After reading it again, I think I essentially hit the mark of what I wanted to say. I too am grateful for the leadership I get to work with AND all the incredible people, like you, who give and give and give that the Lord might be glorified in it all. I think we, the leadership, are the truly blessed ones!